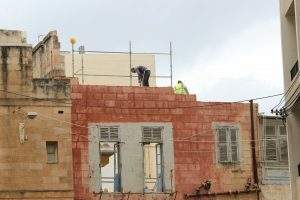 Din l-Art Helwa is appalled at the blatant abuse of policies and laws that should protect our cultural heritage, as is currently taking place at the historic Villa St Ignatius in Balluta Bay, St Julian’s. On the strength of a few broken xorok, the entire wing of this early 19th century building is now being demolished with what seems to be the blessing of the Planning Authority, with the demolition order DS 00125/17. None of the walls were in danger of collapse and it is often the case that broken xorok are simply replaced. Works commenced illegally on Saturday 2nd December with Condition B of the Dangerous Structure (in bold and reproduced below), requesting Perit Alan Saliba to be involved, being blatantly ignored. Perit Saliba has recently taken up the post of Commissioner for the Environment and has confirmed that he was not contacted to overview the works. This means that the Planning Authority knew that all demolition works on Saturday were illegal since this was a condition precedent and yet they have failed to stop demolition works. Furthermore, no signature on the plans showing Planning Authority approval is present. Din l-Art Helwa is shocked at both the applicant architect and the authorities which have approved this. The applicant architect Stephan Vancell works for the architectural firm ‘Environmental Management Design Planning’ of Mosta, where its principal owner is Perit Mariello Spiteri who also sits on one of the planning boards. Restoration and conservation is indeed about the removal of dangerous structures and in this case a few broken xorok. But restoration is not about demolition of our heritage or parts of our heritage. We expect ethical standards from all the architects that practice on this island but even more so from an architect who sits on a planning board which has the power to approve or refuse applications. b) re-instate the demolished fabric as it was. It is also shocking that this demolition has occurred as Din l-Art Helwa asked for the scheduling of this building as an important part of our architectural historical legacy and which gave its name to the street which we now know as Old College Street. Clearly, there is a national attack on our cultural heritage. Whilst our cultural heritage act should protect our heritage since anything over 50 years old is considered part of our architectural legacy, the government is ushering in an era of demolition. Din l-Art Helwa warns the government and the citizens of this country that we will soon have no heritage architecture to pass on to our children. The can of worms is truly opened, and the developers are quite aware that they can get away with demolition of our heritage in order to fuel rampant development and greed.